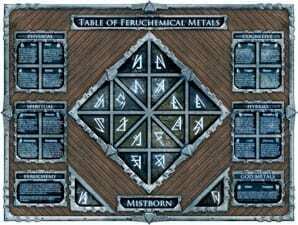 Isaac and Kara at InkWing have news about the Feruchemical Table prints and Szeth shirts. I’ll just quote from their blog post here. This is a limited run of 300 prints MINUS what was sold at Comic-Con (many of the numbers between 101 and 200). A smaller version fine art print and/or 4-color offset poster will be made available at a later date along with desktop wallpaper images. Each is numbered and signed by Brandon and Isaac. Numbers are given in the order they’re sold. The first order on Wednesday will get #1, and so on. Printed with archival inks on archival Ultrasmooth fine art paper. If framed correctly, it might outlast your great-grandkids! Each print has been inspected and approved by the artist. Measurements: 24″H x 26″W paper size, 18″H x 24.5″W print size (this is larger than the Allomantic Table). Prints will be sent out mid to late September (some possibly sooner); this gives us time to prepare, package, and post each print. Cost $75 plus shipping. Prints can be ordered here. 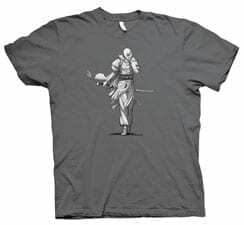 Second, Szeth shirts are now available! Check it out here. Third, August Contest details: This month we will be giving away ONE Feruchemical Fine Art Print Prototype. This one is not numbered, but it is still signed. Same paper and ink as the other prints. To be entered in the drawing just comment [at this link] with a suggestion of another art print you would like to see us produce from existing interior art in Brandon’s books. We are excited to do more! The winner will be picked randomly. We will announce the winner a 1/2 hour before the Pre-Sale starts!!! Good Luck!